This time around, His Editorship wanted me to test some “premium” beer budget priced handguns — I can live with that. I try to keep my price range in the $500.00 or less when looking at beer-budget handguns. And, if you are paying full retail for your handguns, you need to start shopping some place else. All the handguns I tested for this article were all priced below retail at my local gun shop, Fast Cash, in Lebanon, Oregon. New Walther PK380 (top) is only slightly larger than the company’s P22. Pat found that the “ledge” behind the mag release to be too “pointy” on both sides of the PK380 and had to take sandpaper to remove the protrusion. Walther handguns have always caught my eye. Love their PPK/s series, and carried one for a time when I was doing PI work. The PK-380 from Walther is quite a bit different from the PPK line. The PK-380 weighs in at only 19.4 oz with its 3.6" barrel. With 8+1 rounds of .380 ACP, it should discourage a bad guy from doing you harm. I'm not a big fan of the .380 as my first gun, as a back-up, yeah! But that's just me. The PK-380 is a traditional DA/SA pistol, with a de-cocker. It has a polymer frame, and the entire shape of the gun is very different from the PPK line-up, and I liked it. Its size was only slightly larger than the Walther P-22. I had zero malfunctions when testing this pistol with Winchester USA-brand .380 ACP FMJ, and Black Hills .380 ACP JHP and FMJ. The one minor complaint I have is the area above the mag release on the PK-380 — where your thumb and trigger finger rest in a slight depression. There’s a sharp edge on both sides right above the mag release that could prove painful with much shooting. A few seconds with a piece of sandpaper takes care of that sharp edge. Accuracy was more than decent at 15 yards for self-defense purposes. Coming in at $399.00 retail, the PK-380 is a great buy! For more information, visit https://www.waltherarms.com/handguns/pk380/. BLACKHAWK! Products leather belt holster, BLACKHAWK! Products folding knife, Black Hills Ammunition and the Charter Arms Mag Pug — a great set-up for any self-defense use. Cascio added a pair of Crimson Trace laser grips to the Mag Pug. He’s a real fan of lasers on handguns. I've always had a soft spot in my heart for snubby revolvers for some reason, and the Mag Pug fills that spot nicely with it's 2.2" barrel. Weighing in at 23-oz, I knew the Pug was gonna be a handful to shoot with full-power .357 Mag loads, and I was right. It's nothing you can't learn to shoot, and shoot well, with practice. The only .38 Spl. and .357 Mag ammo I had on-hand was Black Hills, which never fails me. The .38 Spl. 125-gr. JHP +P load was a pleasure to shoot. However, when I stepped-up to their 125-gr. JHP .357 Mag load, it opened my eyes. We're talking some serious power there in a little 5-shot revolver. With the Pug, I was still able to keep 5-shots of BHA .357 Mag 125-gr. JHP ammo inside of 3" at 15-yards, which is plenty accurate enough for self-defense. I feel with more practice, I'll be able to cut that group down a little bit. The ported barrel also helped keep my shots where they needed to go. In my neck of woods, stainless steel firearms are a plus in my book because of all the rain we get. The Pug was carried in a BLACKHAWK! leather belt holster, and it was a perfect fit. The only change I made to this revolver was to add a pair of Crimson Trace laser grips. Coming in at $394.00 full-retail (sans the laser grips) the Charter Arms little Mag Pug deserves a good look. For more information, visit https://charterfirearms.com/collections/mag-pug. Want an itty-bitty .380 ACP concealed carry piece? Look no further than the Kahr Arms P380. The Kahr Arms P380 with Crimson Trace laser is about as compact as you can get in an itty-bitty .380 ACP handgun. I picked-up my first Kahr Arms pistol about three years ago. Always heard good things about the Kahr line-up, but until then, never saw one in any of the gun shops I haunt. Since that first Kahr purchase, I’ve had several of their handguns in my hands, and have loved ’em all. Frank Harris, Kahr’s PR/Marketing guru, sent me the little Kahr P380 for testing. The Kahr P380 is a tiny little thing, to be sure. I wasn’t sure I was gonna like it — wrong! The manager at my local gun shop thought it would be the ultimate concealed carry piece, with night sights and a Crimson Trace laser on it, which is the way I had the gun set-up. The night sights were nice and bright for nighttime shooting, and the white outline around the night sights were visible for daytime shooting. The Crimsom Trace laser — that only added to the utility of the overall package — made it a great set-up, all the way around. Weighing only 9.97-oz, with its polymer frame, and holding 6+1 rounds of .380 ACP ammo, a guy could do a lot worse for a self-defense handgun. Again, I’m not a huge fan of the .380 ACP as my main handgun, but it’s sure better than a sharp stick, ain’t it? The Kahr line-up of pistol are all DAO (Double Action Only) and they have a great trigger-pull, too. Kahr recommends that you shoot at least 200-rds of ammo through their guns to break ’em in, before carrying ’em for self-defense. Well, these days, .380 ACP is still in short supply in my neck of the woods, so shooting that many rounds isn’t gonna happen. I had some Winchester USA .380 ACP FMJ on-hand, and from Black Hills Ammunition, their .380 FMJ as well. I ran out of the BHA JHP ammo before I got to this gun. I had zero malfunctions with the little Kahr in slightly over 100-rds of shooting so my gun is good to go if you ask me. Now the price — full retail is $667.00, and add more if you install a Crimson Trace laser (which I highly recommend). Clearly, I blew the budget on this one. But, Kahr also offers a lower-priced version called the CW380 with an MSRP of $419. Part of the company’s “Value Series,” it does not have the premium Lothar Walther Match barrel and only comes with one magazine. So, you still have an option while coming in under the $500 price point. To learn more, visit https://shopkahrfirearmsgroup.com/. Bodyguard .380 was a great shooter, and it loved Buffalo Bore .380 ACP +P loads. Bodyguard 380 fits nicely in a woman’s hand, and felt great. The author ran the Bodyguard with several loads and did not have any issues. Smith & Wesson never sits backs, they are always on the cutting edge of new products. I asked for the S&W Bodyguard .380 for this article. What sets this gun apart from the others I tested is the fact S&W included a built-in laser — neat! Holding 6+1 rounds of .380 ACP, with a 2.75″ barrel, and firing DAO, this little pistol is worth a close look. Weighing only 11.85-oz, this is a light-weight to be sure. The polymer frame helps keep the weight down. Just in time to shoot in this pistol, Tim Sundles of Buffalo Bore Ammunition, sent me some of his .380 ACP ammo to use. Buffalo Bore has quite a selection of .380 ACP ammo, as well as most other handgun calibers. I elected to test a couple of different .380 +P loads in the S&W .380 Bodyguard. Yeah, you read that right, .380 +P. I had some misgivings about a +P-loaded little .380 pistol. I used the 90-gr. JHP and 95-gr. JHP loads in this pistol, again, both loads were +P. The little S&W loved these loads, and was accurate as all git-up and go with these loads. I was impressed! I can’t wait to get out and test some more of Tim Sundles loads. The super-smooth, light DAO trigger really aided my shooting skills with the Bodyguard 380. I liked the trigger pull a lot. The built-in laser is from Insight (while current models come with Crimson Trace units), and I loved and hated it at the same time. The little ambidextrous switch to activate the laser is right in front of the trigger guard, making it easy to turn the laser on when you draw this gun. The reason I “hated” the laser? It was too easy to turn on! Additionally, the laser can be set to steady-on, or pulsing, which is neat! I didn’t have a holster specifically tailored to this gun, but I used a generic-type ballistic Nylon holster, and would find the laser was being activated while in the holster. I think there needs to be either a little “fence” around the on/on laser switch, or the switch needs to be recessed a little bit more than it is. Then again, maybe it’s just me and my fat fingers. The Bodyguard 380 perked along just fine with the Buffalo Bore ammo +P loads. I also ran some Black Hills .380 through the gun without any problems. This is one helluva little .380 for the money, and one I’d recommend to anyone in the market for a little .380. With numerous variations available and an MSRP starting at $379, you can get a lot of gun here for not much money. For more information, visit https://www.smith-wesson.com/mp#/?caliber=57. North American Arms “Guardians” — top is their .380 ACP and bottom is their .32 NAA. Both are first-class back-up guns. Crimson Trace laser grips were installed on the NAA .32 NAA Guardian. Great set-up for us old(er) folks with poorer eye sight. Ken Friel, at North American Arms, sent me a brace of their “Guardian” pistols, one in .380 and the other in .32 NAA. Both guns have the same specs, with the exception of caliber. Both guns hold 6+1 rounds of ammo, both have a 2.49″ barrel, both weigh in at 18.72-oz, both are made out of stainless steel and both are DAO. So, why two different guns? Glad you asked. The Guardian in .380 ACP has been around for quite a while, and the Guardian in .32 NAA (North American Arms) caliber is the newer kid on the block. Right now, we are awash in small .380s on the market. They really took-off a couple years ago, and are very popular with folks who carry concealed on a regular basis. You already know my feelings on the .380 ACP as a main carry gun — I don’t do it. To my way of thinking, the .380 is best relegated as a back-up piece. Still, as I mentioned before, the .380 is sure a helluva lot better than a sharp stick or a rock! I fired the .380 Guardian with Winchester, Black Hills Ammunition FMJ loads and Buffalo Bore +P JHP ammo. There were no problems at all, and the gun went bang each time the trigger was pulled. Accuracy was more than acceptable at 15 yds. The .380 Guardian had the new Gutter Snipe type of sights milled into the slide, with night sights. If there’s one thing I don’t like on many itty-bitty .380s, it’s the smallish sights many come with, since my aged eyes can’t pick ’em very clearly. The Gutter Snipe sights on the .380 Guardian were really crisp and easy to see; a worthy addition at an extra cost if you ask me. The .32NAA — His Worthy Editorship, suggested I test this gun — said I’d really like it. Damn it, I hate it when he’s right! The .32 NAA Guardian was basically the same as the .380 ACP, with the exception of standard, small front and rear sights, and the difference in caliber. I’m here to tell you, I’m totally impressed with the .32 NAA round. I was sent two different rounds, one is the 72-gr. FMJ round at 1,000 fps, and the other is the 60-gr. JHP round, screaming out of the barrel at 1,200 fps. I’m not a scientist, and I don’t believe in a lot of ballistic testing that go on. I did a limited number of tests of my own with this new caliber, just using 1-gallon plastic jugs full of water and the .32 NAA round at 15-yrds. The 60-gr. .32 caliber bullet would consistently mushroom to about 49-50 caliber when fired into the water jugs. Additionally, the bullets would shed about 10 grs. of weight. All bullets easily passed through two water jugs — that’s 12″ of water — and would stick in a board on the backside of the second water jug. Those are pretty impressive results for such a small bullet, fired from a small pistol. Basically, the .32 NAA is a .380 ACP case necked-down to .32 ACP caliber. It works, and works well. What I really liked about the NAA Guardians is you can purchase just about all manner of accessories from NAA for these guns. Want different grips? They have ’em. All sorts of holsters are available, too, as well as spare mags. I put on a pair of Crimson Trace laser grips on the .32 NAA sample and it makes for a dandy combination. The NAA website is a wealth of information on all their guns, too. Was I impressed with the two NAA Guardians? You betcha! Retail price is around $449.00 for either gun, and they can be found for about $50.00 less than that if you shop around. For more information, visit https://northamericanarms.com/. 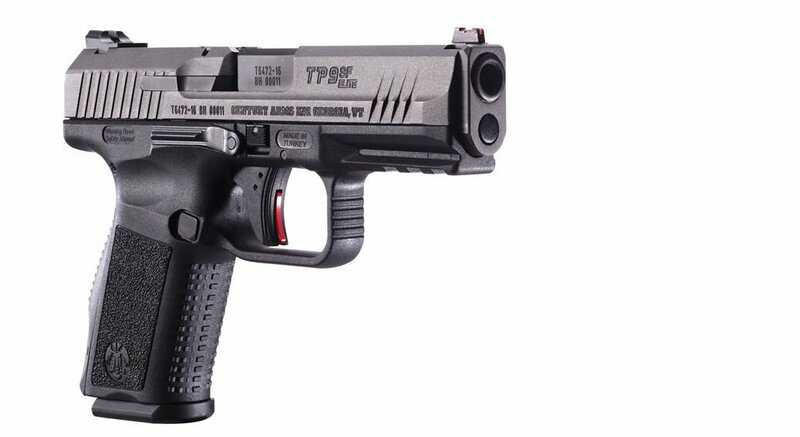 The Canik TP9SF Elite packs in a ton of power and performance at a truly affordable price. Image courtesy manufacturer. Looking for a gun that is a bit larger on the concealed carry scale, but still small enough to hide — as well as still fit under that $500 price point with an MSRP of $499? Then take a look at the Canik TP9SF Elite. This 9mm pistol packs in 15+1 rounds with a flush-fitting magazine yet weighs in at only 28 ozs. empty. It measures in at 7.28″ in overall length, with a 4.19″ barrel. On the price, bear in mind that the $499 is the suggested retail, meaning you’ll likely find it for much cheaper on the dealer’s shelves. And you are not getting a bargain-basement gun for the bargain price. Sights on the pistol are the excellent Warne Tactical red and green fiber optic sights, and the polymer-framed pistol is available with Tungsten Grey, OD Green or standard Black finishes. The striker-fired pistol is designed to be used by a wide range of shooters, with an interchangeable backstrap system for customizing the grip as well as an ambidextrous slide release and reversible mag release (appreciated by this southpaw). In addition, the pistol comes with a spare magazine, polymer holster, mag loader, cleaning tools and more, all packed in the foam-lined plastic case. For more information, visit https://www.centuryarms.com/tp9sf-elite-16410.html.